Today my 8 year old had a hard time going to school. After many small conversations, cuddles, and affirmations we made it to school and on time no less. By the time we got to the drop off point and she got out of the wagon (that I promised she could ride in if she’d just get out of the house) we realized she still had her blankie with her. We gently wrapped the blankie in the bigger blanket we had with us so it wouldn’t get wet from melted snow and she bravely marched into school. I ran some quick errands around the neighborhood and then came home making sure the blankie made it safely back to the house with me. What strikes me as I think about our experience this morning is how I treated the blankie. I gave it gentle caring attention even when my girl wasn’t there to see it. I made sure it didn’t get dirty or wet, and even made sure I kept my eye on it when I was getting coffee at the coffee shop. This piece of cloth has value. Not because the world places value on it but because my little girl sees value in it. When I am entrusted with this valuable piece of cloth I don’t take my duty lightly. Even when it doesn’t smell very good. Or when it’s slightly damp because its owner has taken to chewing on it when she’s nervous. I can’t get away from how much this sound like Jesus’ sweet loving care of us. We have value. Not because the world necessarily sees us as valuable but because Jesus does. 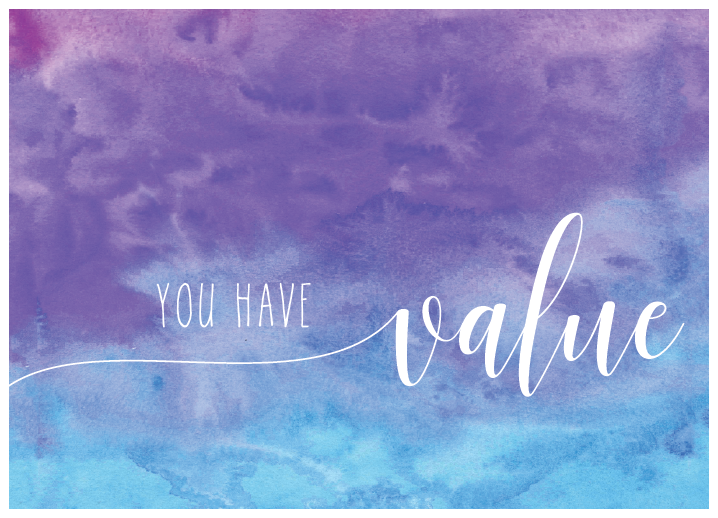 Even when we aren’t at our best, He sees value in us. Even when we don’t behave properly, He sees value in us. Even when we don’t seem to have anything to contribute we are valuable in His eyes. Once I believe and trust that Jesus sees me as valuable it becomes easier to see others as valuable. And when Jesus entrusts me with what He declares is valuable my prayer is that I don’t take my duty lightly. That I show gentle loving care to everyone that crosses my path. From those nearest me to those chance encounters. Sweet Jesus help me see value where You see value. Grace and peace to you dear friends as we gear up for Sunday! Tracy! Thanks for the comment. Hope all is well in your neck of the woods.